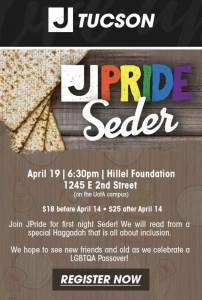 We would love to see there: Join JPride for first night Seder! We will read from a special Haggadah that is all about inclusion. We look forward to welcoming new friends and old as we celebrate freedom: A LGBTQA Passover! All are Welcome!